Marine painting enshrines the love of ships and the sea, and in the best examples one can almost feel the salt spray and hear the snap of the sails. 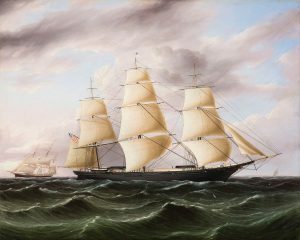 James E. Buttersworth, Clipper Ship Black Warrior, circa 1853, oil on canvas, 29 x 36 inches. Mary Blood Mellen, Ship at Anchor on a Lee Shore, circa 1858, oil on canvas, 24 x 36 inches. Guy C. Wiggins, Morning, Gloucester 1915, oil on board, 12 x 16 inches. The field of marine painting, in theory, is as vast as the ocean itself. Ships and the sea have been favorite themes of artists since ancient times. Greek vases and Roman murals depicted boats bearing men and gods on errands historical or mythological. Renaissance painters such as Pieter Bruegel the Elder loved to paint panoramic views of naval battles, such as his 1598 view of the engagement in the Gulf of Naples. Even Rembrandt, usually a landlubber, couldn’t resist painting a dramatic Storm on the Sea of Galilee (now sadly lost, a victim of the Isabella Stewart Gardner Museum heist in Boston in 1990). 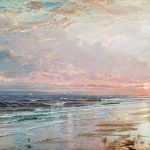 Romantics such as Turner or the Hudson River School painters loved the way water interacts with the sky at the horizon, the atmospheric effects of moisture, and the reflection of a setting sun in a lake or sea. One of the biggest names among classic marine artists is James E. Buttersworth (1819–94). Born in England, the son of a marine painter, Thomas Buttersworth, James emigrated to the U.S. in about 1847. 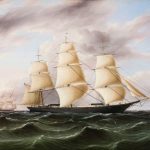 He worked for the firm of Currier & Ives—a reminder that marine art in those days was not just for the elite collector but was disseminated to the population via inexpensive reproductive prints made from paintings. Buttersworth specialized in portraying clipper ships, then the fastest vessels in existence. His Clipper Ship Black Warrior (circa 1853), available from Godel, skillfully depicts this medium-sized ship, which was launched in 1853 from the shipyard of Austin & Company of Damariscotta, Me., and sailed to Australia and South America. Buttersworth chose a low vantage point to paint the Black Warrior, in order to bring the viewer alongside it in the water, so to speak, and also took care to also devote some bravura brushwork to the dark, whitecapped ocean itself as well as the pink-tinged clouds. Nature and the works of man get equal time in the best marine paintings. Another sub-genre of American painting that falls within the category of marine art is the Luminist School. A later iteration of the Hudson River School, the Luminists (not called that at the time, only by 20th-century art historians) concentrated on still, mirror-like waters, sunsets, and ships at anchor in harbors, all with the goal of conveying a deep and glowing light and a profound sense of peaceful stillness. 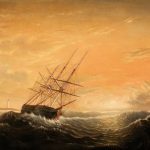 The top Luminist is generally considered to be Fitz Henry Lane (1804–65), whose works are now extremely scarce on the market. Lane had a female student, Mary Blood Mellen, who collaborated with him (some paintings are signed with both their names) and carried on painting in his style after his death. Her Ship at Anchor on a Lee Shore (circa 1858) is very similar to a Lane painting from about four years earlier, A Rough Sea. Paintings from the early to mid-20th century, executed in a more Impressionistic style, are also popular. Irving Ramsey Wiles’ White Sloop, Peconic Bay (1907), for example, shows off the artist’s brushy style, which has often been compared to that of John Singer Sargent. 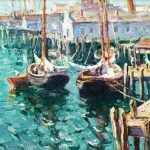 Another East Coast Impressionist who painted many marine subjects is Guy Wiggins, a student of William Merritt Chase and Robert Henri. In his Morning, Gloucester (1915), the dappled reflections off the water steal the scene, and the overall effect resembles that of Childe Hassam. 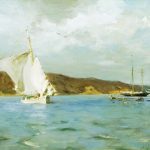 Some prefer the looser painting of the American Impressionists, but in general the current marine market seems to favor the crisper style and more descriptive approach of the 19th-century masters.